Previous studies by Volloch and coworkers have reported that during the expression of high levels of β-globin mRNA in the spleen of anemic mice, they could also detect small but significant levels of an antisense (AS) globin RNA species, which they postulated might have somehow arisen by RNA-directed RNA synthesis. For two reasons we undertook to confirm and possibly extend these studies. First, previous studies in our lab have focussed on what is an unequivocal example of host RNA-directed RNA polymerase activity on the RNA genome of human hepatitis delta virus. Second, if AS globin species do exist they could in turn form double-stranded RNA species which might induce post-transcriptional gene silencing, a phenomenon somehow provoked in eukaryotic cells by AS RNA sequences. We reexamined critical aspects of the previous globin studies. We used intraperitoneal injections of phenylhydrazine to induce anemia in mice, as demonstrated by the appearance and ultimate disappearance of splenomegaly. While a 30-fold increase in globin mRNA was detected in the spleen, the relative amount of putative AS RNA could be no more than 0.004%. Contrary to earlier reports, induction of a major increase in globin transcripts in the mouse spleen was not associated with a detectable level of antisense RNA to globin mRNA. Over the years there have been numerous claims for the detection within prokaryotic and eukaryotic cells of antisense RNA sequences (AS). As recently reviewed by Kumar and Carmichael , many of the claims have been substantiated and in a subset of these, biological significance has been established. The origin of most of these AS sequences is transcription via DNA-directed RNA polymerization. A much more controversial issue is whether there is AS RNA that arises via RNA-directed RNA polymerization. Of course, for RNA viruses that encode their own polymerase activity, such AS RNA arises as a natural part of the replication cycle for the viral genome. And yet for the subviral RNA agents of plants known as viroids, and for the human (subviral) agent known as hepatitis delta virus (HDV), the replication of the RNA genome involves a host RNA polymerase . Evidence has accumulated but not established that the relevant polymerase activity is via redirection of a polymerase that normally uses host DNA as a template. For example, it is considered that HDV replication and that of some plant viroids might involve redirection of the host RNA polymerase II [3, 4]. Other plant viroids are considered to replicate via redirection of a chloroplast polymerase activity . In contrast to such proposed redirection, studies in plants have found a non-viral host RNA-directed RNA polymerase activity [6,7,8]. After the gene for one of these was cloned and sequenced  it was soon found that homologs existed in virtually all plant species and also in fission yeast, zebrafish, Drosophila, and nematodes . Recently, this activity has been of particular interest because of exciting findings in the area of post-transcriptional gene silencing and RNA interference. Many papers and reviews have been published recently on these topics and it is clear that the suppression mechanisms involve regions of double-stranded RNA and in some cases, RNA-directed RNA polymerase activity . Two recent papers show clearly that specific silencing can be induced in mouse oocytes by complementary RNA sequences [12, 13], but apparently there is no involvement of RNA-directed RNA polymerase activity. For the above reasons we were intrigued by the possible relevance of several specific claims for AS RNA and RNA-directed RNA polymerase activity in mammalian cells. In a series of papers by Volloch and coworkers AS RNA was reported for as many as 6 mammalian mRNAs and even RNA-directed RNA polymerase activity was proposed [14,15,16,17]. These papers focused on mouse β-globin in particular, but they also proposed AS to the mRNAs for serum amyloid A, insulin receptor, eukaryotic transcription factor eIF-4D, vasoactive intestinal polypeptide and syndecan. Most of these data were obtained by a procedure sometimes known as ligation-mediated polymerase chain reaction, that was actually pioneered by the Volloch lab . However, in two studies the authors also presented Northern data [14, 15]. They first treated mice with phenylhydrazine (PHZ) to induce high levels of β-globin mRNA in the spleen, and reported that the RNA from the spleen contained low but significant amounts of an AS RNA species with a size of about 600 nucleotides, the size of the mature mRNA . Also, by ligation-mediated polymerase chain reaction they reported determinations of both 5'- and 3'-ends for this AS RNA . Volloch et al. speculated that the AS species they detected arose via some form of RNA-directed RNA polymerase activity, and further, they suggested that this was a mechanism for the cell to amplify globin mRNA species. Therefore, with these things in mind, we attempted to confirm and extend the most recent study of Volloch et al. .
Injections of phenylhydrazine (PHZ) into the peritoneum of the mouse were used in previous studies to destroy erythocytes and induced anemia that in turn produced an increase in β-globin mRNA in the spleen. We followed the protocol , as used by Volloch et al. It involved 6 daily injections of PHZ into the peritoneal cavity. In the study of Volloch et al., they only reported results for samples taken at a single time, day 8. However, since we were interested in the possibility that the status of the animal in this response might be important, we considered animals taken before (i.e., untreated control mice), during, and following the PHZ treatments. As shown in Fig. 1, the mass of the mouse spleen increased 5-fold even by day 5. This splenomegaly was maintained for at least 3 days after the injections were halted. After 10 days (i.e., 15 days after the PHZ injections were begun) the spleen was reduced in size but was still 2-times bigger than the mass prior to day 0, the time of initiation of the PHZ injections. Induction of splenomegaly by treatment of mice with phenylhydrazine. Mice were subjected to i.p. 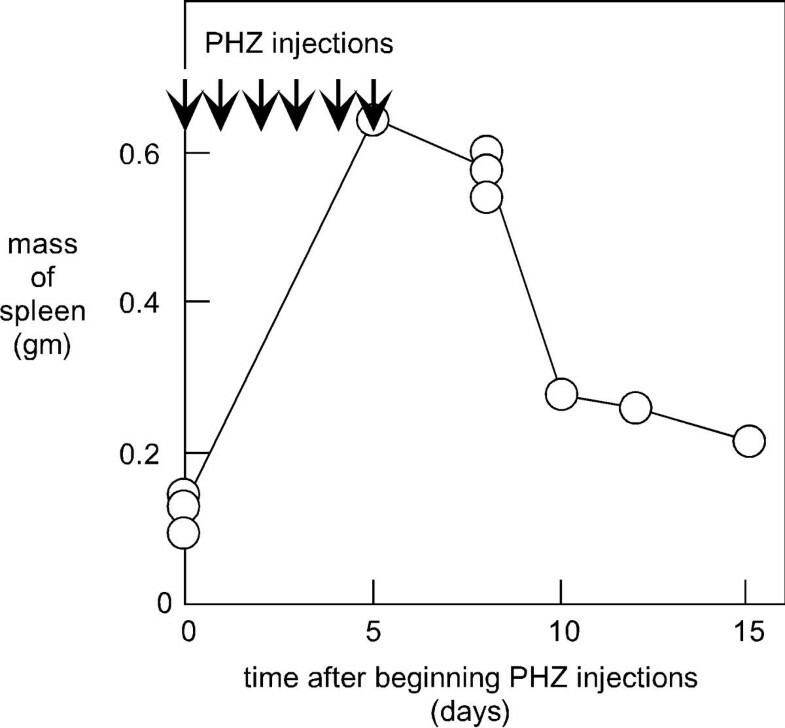 injections of phenyhydrazine (PHZ) solution at the times as indicated by arrows in the figure. Subsequently animals were euthanized and the spleens removed and weighed, as indicated. Each circular symbol represents a single mouse. Clearly, as a consequence of PHZ treatment, the spleen promptly underwent a major increase in mass that was followed by a return to almost normal size. To explore the possibility that some form of antisense RNA with or without PTGS, was involved either during or after treatment, we examined RNA samples taken at a series of times. In the earlier studies Volloch et al. assayed for β-globin sequences using a 27-nt oligonucleotide that was 5'-end-labelled with 32P as a probe. We synthesized the same oligonucleotide to detect the mRNA in the RNA extracted from the mouse spleen (Fig. 2A, lanes 4-9). Relative to DNA markers, the size of the globin species was around 600 nt, as expected for the globin mRNA . Note first that even prior to treatment, the spleen RNA presented a strong signal for β-globin mRNA (lane 5). We detected an increase in the amount of this species as a consequence of the PHZ injections. For example, at day 8 after the beginning of the PHZ injections, the amount of β-globin mRNA was increased 6-fold (per microgram of extracted RNA). Thus, after allowance for the 5-fold increase in splenic mass (Fig. 1), we deduce that the level of accumulation of β-globin mRNA per spleen was increased about 30-fold as a consequence of the PHZ treatment. Northern assays for sense and AS β-globin RNA in RNA extracted from spleens of anemic mice. Duplicate aliquots (30 μg) of RNA extracted from the spleens of animals as described for Fig. 1, were glyoxalated and electrophoresed into 2% agarose gels. After electrotransfer, the set of aliquots on one filter were hybridized with a 5'-labeled oligonucleotide to detect the sense strand of β-globin RNA (panel A). A second filter, with the same set of aliquots, was hybridized with a complementary oligonucleotide, to detect AS β-globin RNA (panel B). After quantitation of the radioactivity using a Bio-Imager, the two filters were stripped and rehybridized with radioactive full-length RNA probes to detect either the globin sense (panel C) or AS sequence (panel D). Again after quantitation of the radioactivity, the filter used in panels B and reused in D was stripped once more and rehybridized with an RNA probe to detect both the sense strands of GAPDH and 28 S rRNA (panel E). Lanes 1-3 represent hybridization standards of in vitro transcribed globin AS RNA (lane 1), globin sense RNA (lane 2), and double-stranded globin cDNA (lane 3). As expected, these three standards exhibit mobilities somewhat faster than that of mature globin mRNA. In all panels lanes 4-9 represent RNA from spleens of mice at 0, 5, 8, 10, 12, and 15 days, respectively, after the beginning of the PHZ injections. As size standards we used 5'-labelled DNA fragments, with sizes indicated at the left of each panel. This greatly increased level of β-globin mRNA in the spleen was probably attributable to multiple factors, e.g., increased rates of transcription could be one of the factors, but there is no doubt that the number of reticulocytes in the spleen was increased under these conditions. In order to detect AS copies of the RNA we used as a probe, an oligonucleotide that was the exact complement of that used to detect the mRNA. As shown in Fig. 2B, this probe failed to detect AS globin RNA in any of the splenic RNA samples. As positive controls for this we used full-size AS RNA as transcribed in vitro (lane 1) and also double-stranded globin cDNA (lane 3). As a negative control we used in vitro synthesized globin sense RNA (lane 2). After normalization relative to the observed detection sensitivities for the RNA standards, we deduced that in the normal or anemic mouse spleen the amount of the AS strand, if it existed, was <0.004% relative to the amount of sense strand. This inability to detect AS globin RNA was in contrast to the reports of Volloch et al. who reported 1-3% in spleen cells . This contrast was more surprising because we used exactly the same oligonucleotide probes as those reported by Volloch et al. The discrepancy may have arisen because of differences in hybridization conditions, such as stringency; unfortunately, we were unable to find the conditions of hybridization used by those authors. The strategy of detecting RNA sequences with an oligonucleotide probe would be less sensitive than using a uniformly labeled RNA probe complementary to the entire globin mRNA. We therefore made use of such a probe to detect the mRNA and a corresponding probe for the putative AS RNA. As shown in Fig. 2C we obtained clear positive results for the detection of the mRNA (lanes 4-9). However, in contrast to before, we now observed for the spleen samples a band when we used the full-length probe to detect AS RNA (Fig. 2D, lanes 4-9). For panels A-D the appropriate positive and negative controls for the hybridization are shown in lanes 1-3. Also, as controls for host RNAs in the spleen samples, we hybridized to detect both 1.2 kb GAPDH mRNA  and 4.5 kb 28 S rRNA (Fig. 2E). For all six spleen samples (lanes 4-9) the signal of 28 S rRNA per fixed amount of total RNA was essentially constant. From an evaluation of these data we consider there are two reasons that lead us to conclude that the "AS signals" detected for the spleen samples in lanes 4-9 of panel D are an artifact. First, the electrophoretic mobility of these bands was indistinguishable from those of the mRNA (Fig. 2C). It needs to be pointed out that Volloch et al. reported that their AS band was of a greater mobility than the mRNA  although in an earlier study they said the mobilities were indistinguishable . Second, and of more significance, not only were the signal strengths of putative antisense relative to sense globin the same (about 3%) for each of the 6 spleen samples (lanes 4-9, panels C and D) but the same ratio was obtained for the standards of antisense and sense standards, that were synthesized in vitro. In other words, most, if not all, of the signal that appeared as AS RNA in the splenic samples was explainable as an artifact of hybridization. Overall, the two main conclusions from these northern analyses are first, that no AS to globin RNA was detected with oligonucleotide probes and second, that the signal detected with a full-length RNA probe was, at least predominantly, due to an artifact of hybridization. As reviewed in the Introduction, it is important to know not only whether post-transcriptional gene silencing occurs in mammalian cells but also whether it can apply under natural conditions, that is, as a regulatory response to enhanced expression of a host RNA species. With this in mind we investigated whether the prior reports of AS to β-globin RNA in anemic mouse spleen could be confirmed and possibly extended. To do this we first established the same procedures in which phenylhydrazine injections were used to induce anemia in mice. We documented the production of a significant and transient splenomegaly (Fig. 1). This was associated with a transient 30-fold increase in the amount of β-globin mRNA per unit mass of spleen RNA, followed by a decrease to almost pretreatment levels (Fig. 2A and 2C). From northern analyses and use of specific oligonucleotide probes, each exactly as reported by Volloch et al., we were unable to detect any AS globin RNA sequences (Fig. 2B). Furthermore, from the use of appropriate control hybridization standards, and quantitation using a bio-imager, we deduce that relative to the amount of sense RNA as 100%, the putative AS, if it exists, would have to be less than 0.004%. We thus can not understand how Volloch et al. reported that spleen cells contained 1-3% amounts of AS globin . When we replaced the oligonucleotide probes with more sensitive RNA probes that were uniformly labeled and corresponded to the full-length mRNA (Fig. 2C-D), we did detect a species that appeared to be AS globin RNA (Fig. 2D). It was suspect that this species had an electrophoretic mobility indistinguishable from that of the detected sense RNA (Fig. 2C). However, as described in the results, we can conclude that the signals detected were at least predominantly due to a hybridization artifact. One interpretation of this artifact might be that it arose because of the intramolecular base-pairings in the globin mRNA. This would allow that even radioactive sense sequences might make interactions in a northern analysis with unlabeled sense RNA, even under conditions (hybridization and subsequent washing at 65°C) that we would consider stringent. However, a more likely explanation is that as an artifact of in vitro transcription, the radioactive RNA probes also contain trace amounts of the opposite strand; thus, when used in hybridization in the absence of appropriate specificity controls, one might detect species that would be incorrectly interpretted as AS RNA species. Balb/C mice were rendered anemic by 6 daily intraperitoneal injections of phenylhydrazine (Sigma)(PHZ), using the protocol described previously . Each injection was of 0.1 ml of 0.8% neutralized PHZ in 0.015 M sodium acetate. At days 5, 8, 10, 12, and 15, animals were euthanized and the spleens promptly removed and weighed. Aliquots of 50-100 mg were then incubated at 4°C in a solution of RNAlater (Ambion), after which the liquid was removed and the samples frozen at -80°C. Frozen samples of spleen tissue were added directly into 10 volumes of Tri-Reagent (Molecular Research Center) followed by immediate processing using a Brinkmann homogenizer. We then followed the manufacturer's instructions to collect the RNA free of DNA and protein. A plasmid containing the entire 584 nt mouse β-1-globin mRNA sequence, as derived by the Image Consortium (#2779867, AW742238) was obtained from Incyte Genomics (CDNA-1401). To make (radioactive or non-radioactive) globin sense RNA sequences, the plasmid was cut with NotI and transcribed in vitro with phage T7 RNA polymerase (Promega). Similarly, to make AS RNAs the construct was digested with EcoRI and copied with phage T3 RNA polymerase (Life Sciences). From this construct we were also able to release the double-stranded cDNA insert, for use as a hybridization standard for normalizing the hybridizations to detect sense and AS strands of globin sequence. In order to detect glyceraldehyde-3-phosphate dehydrogenase (GAPDH) we used a construct with a 1 kb EcoRI cDNA fragment inserted into pBS SK- (Stratagene) to make an RNA probe. Intact globin RNA species were detected by northern analysis subsequent to glyoxalation and electrophoresis using 2% agarose gels. For Fig. 2A-B, strand-specific radioactive DNA probes of the same specific activity were obtained by the 5'-labeling using γ-32P [ATP] (7,000 Ci/mM, ICN) of the same two synthetic 27-nt oligomers as used in Volloch et al. . Globin mRNA was detected with 5'-GTGGCCACTCCAGCCACCACCTTCTGG and AS RNA with 5'-CCAGAAGGTGGTGGCTGGAGTGGCCAC. For Fig. 2C-D we used full-length 32P-labeled RNA probes synthesized in vitro. Hybridization was carried out at 65°C in Econo™ hybridization buffer (Research Products International). For Fig. 2E, the filter was hybridized with an RNA probe specific for mouse GAPDH mRNA. This work was supported by grants AI-26522 and CA-06927 from the N.I.H., and by an appropriation from the Commonwealth of Pennsylvania. Anthony Lerro and Jackie Valvardi performed the animal experiments. Maureen Murphy provided the GAPDH clone. Finally, constructive comments on the manuscript were provided by Glenn Rall, Richard Katz, Jinhong Chang, and Gloria Moraleda.